Why Aren’t Millennials ‘Killing’ Cleaning Products, Too? Millennials are having a huge impact on countless industries. It seems that every couple of weeks, a new story pops up—millennials are killing casual dining, millennials are killing beer, millennials are killing napkins. That’s right—millennials are opting for paper towels over napkins. But what about the cleaning products industry? SC Johnson, Procter & Gamble, and Reckitt Benckiser, the world’s top names in the household cleaners market, all project sales growth. In fact, the global household cleaners market is predicted to grow 4.1 percent a year through 2024, according to Transparency Market Research. While some companies are nevertheless cautioning against optimistic expectations when younger generations are on a growing health kick, most companies are prospering. At the time of this writing, Procter & Gamble stock is up nearly 12 percent in 2019. 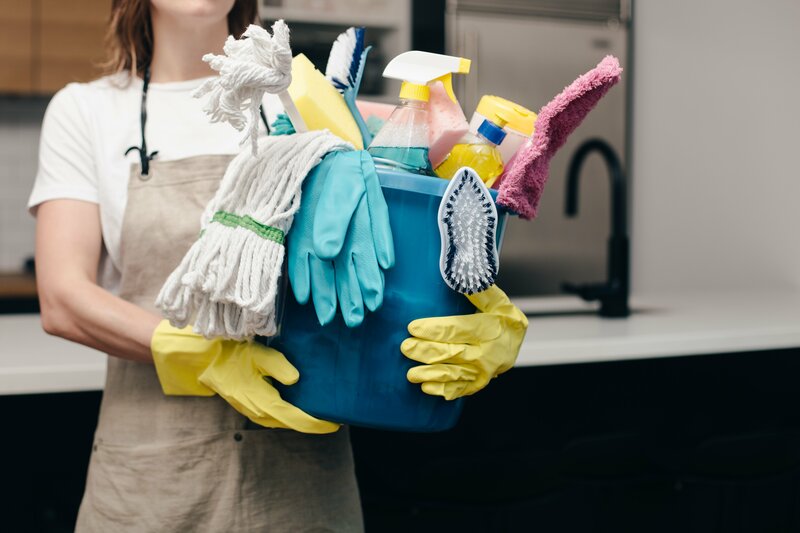 For one thing, because terms like green, eco-friendly, and natural are marketing terms with no legal definition, most millennials don’t know what’s lurking in the cleaning products hiding under their kitchen sink. Despite colorful labels with pictures of green fields and yellow flowers, most home cleaning products that line supermarket shelves are in fact chemical cocktails. That’s because, in part, there are no federal regulations regulating cleaning products. Although some manufacturers are transparent about their ingredients, they are not required by the U.S. Environmental Protection Agency (EPA) to list everything. So makers often label their products green or eco-friendly without them truly being so. Even products from popular brands like Seventh Generation, Method, Mrs. Meyers, Honest Company (founded by actress Jessica Alba), and Green Works contain toxic chemicals—although these products are far safer than others. The hard truth is that most cleaning products can irritate the eyes or throat, or cause headaches and other health problems, including cancer. Several release some scary stuff that is banned in other countries. That’s right—banned. Some cleaners discharge volatile organic compounds (VOCs), while still others include harmful ingredients like ammonia and bleach. In 2012, the Environmental Working Group, a nonprofit research organization based in Washington, DC, published a Cleaners Hall of Shame to reveal many of these hidden hazards, including some you won’t recognize or can’t pronounce. Reading it is enough to make your skin crawl. So misinformation is one reason millennials aren’t ‘killing’ the household cleaning products industry. Another reason is that some millennials make cleaning product decisions based on a perceived ability to get the job done rather than using the same benchmarks they use when making health-conscious diet and exercises choices. Think about that for a minute. Most of us grew up believing bleach is the perfect disinfectant. In fact, bleach is so ingrained in our lives it might as well receive a nod from the White House. Interestingly, after the disinfecting ability of bleach was discovered by French chemist Antoine-Germain Labarraque in 1820, demand for it was so sizable that it became the primary method to sanitize kitchen, bathroom, and other surfaces around the home. Today, Clorox household bleach, acquired by Procter & Gamble in 1957, has become one of the best-selling cleaners in the world. The good news is that while science continues to expose the dangers bleach and other cleaning chemicals pose, a professor in the Department of Environmental Health at the University of Michigan published a report in the American Journal of Infection Control that says steam cleaners armed with a patented technology called Thermo Accelerated Nano Crystal Sanitation (or TANCS for short) beat the pants off bleach. I know what you’re thinking: That’s amazing but a steam cleaner is way more expensive than a bottle of bleach. You’re right—especially a steam cleaner equipped with TANCS. The cheapest option for home use costs $1,680. And that’s important because for millennials, price matters. According to a report by Nielsen, a New York-based international marketing research company, today’s younger consumers are more willing than other buyers to take initiative on matters relating to their health. And despite being price sensitive, they are prepared to spend big bucks to live a healthy lifestyle. If you’re not familiar with steam cleaners, check out an excellent video from Melissa Maker the founder of Clean My Space, a housekeeping service based in Canada. But don’t fret if after watching the video you decide cleaning with steam isn’t right for you. While so-called green cleaning products from Seventh Generation and the like aren’t perfect, they’re better than any alternative you’ll find walking down the aisles at any supermarket. And fortunately SC Johnson, Procter & Gamble and Reckitt are also taking steps to save us from toxic doom. They know that if they don’t, as the reality sinks in that the products they use to clean their homes contain dangerous chemicals—even those thought to be chemical free—Millennials are going to wreak havoc on the cleaning industry like they’ve supposedly done with other industries. In the meantime, while it’s not safe to clean your shower with most supermarket cleaners (come on, admit it, you’ve felt ill after inhaling too much bleach), it’s exciting to imagine a future in which bleach and other cleaning chemicals are a relic of a bygone era. Hopefully, one day soon, consumers of all ages will recognize that using today’s conventional cleaning products is akin to using smoke signals instead of cell phones.